I specialise in compensation claims relating to child brain injury and have particular expertise in cerebral palsy cases. A wide range of rehabilitation therapies are available in the treatment of cerebral palsy. I have a particular interest in the benefits of hippotherapy, the use of horse riding as therapeutic or rehabilitative treatment, and the positive impact it can have on the physical and mental wellbeing of children with cerebral palsy. Cerebral palsy results from damage to the brain. It can arise from abnormalities during the development of the brain during pregnancy, complications during birth or as a result of neonatal illness after birth. Mixed cerebral palsy- combination of two or more of the above. Children with cerebral palsy often have problems with controlled functional movements. Some children have too much muscle tone which leads to stiffening of the limbs and difficulties relaxing the muscles, others have poor tone leading to floppiness. The presentation varies greatly depending on the individual, the limbs affected and the parts of the brain which have been damaged. The idea of using horses in the treatment of neurological disorders was first raised in the late 19th Century. The concept evolved slowly and by the 1970s the use of horses in the treatment of cerebral palsy began appearing in scientific literature. Studies in the past 45 years have reported early improvements in physical and psychological conditions in children with cerebral palsy following regular hippotherapy sessions. Further research is however required into the optimal frequency and duration of the therapy which will undoubtedly fluctuate on a case by case basis. 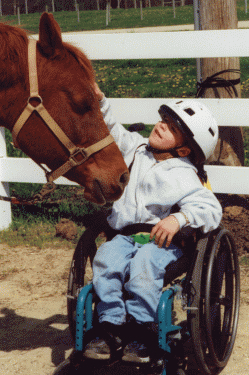 What are the physical benefits of Horse-Riding for children with cerebral Palsy? The rhythmic movement and shape of the horse simulates a walking motion in the legs of the child riding the horse which helps promote increased blood flow and muscle stimulation. This in turn strengthens their legs, which when coupled with other therapies can be instrumental in improved movement and in some cases the ability to walk. To maintain their position on the saddle and direct the horse the child must use muscles in their trunk, move their eyes in a focused manner and develop a good sense of balance. Many children, with the right direction and teaching can achieve normal posture and balance on a horse; skills which are key to function and increased physical independence when not riding. Recent research also shows that horse-riding encourages vocalisation in children; the experience itself motivating the child to express themselves as well as improvements in breath control, coordination and swallowing, all of which contribute to improved speech and oro-motor function. What are the Emotional and Psychological Benefits of Horse-Riding for children with cerebral Palsy? Developing confidence and sense of responsibility. Is there a place for hippotherapy in the litigation process? The use of hippotherapy in children with cerebral palsy is a relatively new, and exciting concept. When the Defendants have admitted fault, and interim compensation is available, careful consideration is given to the diverse needs of our clients. Part of this consideration and assessment includes instructing experienced and dynamic experts to consider the activities and equipment that will benefit the children we represent so that we can ensure it is put in place and financed as part of an ongoing therapy package. In light of the encouraging research into hippotherapy I anticipate that, where appropriate, we will be giving increasing consideration to its provision as part of the ongoing therapy and treatment package for our clients with cerebral palsy. I am a Senior Associate Solicitor at Bolt Burdon Kemp specialising in Child Brain Injury claims. If you or a loved one have suffered an injury as a result of someone else’s negligence or you are concerned about the treatment you have received, contact me free of charge and in confidence on 020 7288 4843 or at claudiahillemand@boltburdonkemp.co.uk for specialist legal advice. Alternatively, you can complete this form and one of the solicitors in the Child Brain Injury team will contact you. You can find out more about the Medical Negligence team.